One of the fiercest pass rushers to graduate from the Mickey Andrews Academy of Dominating Defense is looking for his next team. Alonzo Jackson (1999 - '02) has been on four pro rosters since being drafted in 2002. The latest, the Calgary Stampeders of the Canadian League. A.J. 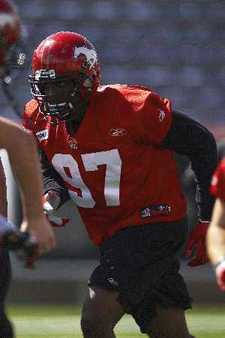 's speed and size seemed ideal for the CFL. But this time it was Alonzo who got sacked. Cut before the regular season kicked off, he's currently working the phones, hoping for another shot, another training camp. We spoke to him while he was in Calgary, just before he hit the practice field. G & G: You were drafted by the Steelers. How did those two years go in Pittsburgh? A.J. : "I learned a lot up there, but the only thing about going to Pittsburgh is that they changed me from defensive end over to outside linebacker. And I had to learn a whole new position and covering receivers downfield. But I learned a lot about how offensive coordinators try to attack the defense, just to further the experience I got at Florida State." G & G: Then you went to the Eagles? A.J. : "I left Pittsburgh and tried to get back to playing defensive end in Philly. And I met another Seminole guy, Tra Thomas, and we battled at defense and offensive tackle going back and forth. And he really helped my technique out some more. Then I went to the Giants and met up with another FSU grad there, Erie Moore, and tried to get better." G & G: Have you survived your pro career without serious injuries? AJ: "Yes, I was taught well at Florida State by Coach Jost, and in earlier years by Coach Van. And I've been trying to take care of my body, staying in shape and continuing to lift throughout the season. That's the Seminole way, baby." G & G: What was your biggest thrill wearing a Seminole uniform? AJ: "You can never top being number one. It was the only time in my life I walked off the field and knew I was the absolute best, and that was in 1999 when we won the national championship." G & G: How do you feel about all the coaching changes at FSU? AJ: "I know that Coach Bowden is going to do everything he can to get us -- you notice I said us -- back to winning the ACC championship and get into a BCS bowl to win a national championship. And I know if nobody else will get us right, Coach Andrews and Coach Bowden will get us right." G & G: Coach Amato is coaching linebackers again. How much did he shape the D when you were there? AJ: "My first two years there, Coach Amato and Coach Andrews were the heart and soul of the defense. And I can tell you Coach Amato is going to have the most in-shape linebacker corps ever." ChantRant: So who's the loudest on the practice field, Coach Amato or Coach Andrews? AJ: "Oh, they're running neck and neck. But when Coach Andrews gets going, you gotta duck and hide. I've gotta say Coach Andrews is the coach I respect most in my football career, because you can look and see the fire in his eyes. And he translates that and puts that into his players." G & G: In the locker room he must lighten up and pat you guys on the back, right? AJ: Naw, I've never seen that side of him (laughs). This is what he told me and this has stuck with me forever. He looked me in my eyes — I think I was a freshman — and said 'I'm striving for perfection. I want you to be perfect. Every time, every snap. From your feet to your hands to your stance. I know you can't be perfect all the time. But if you strive for perfection, you'll be much better.'" G & G: Speaking of motivation, what's the best halftime speech or motivational moment you remember from Coach Bowden? AJ: "We were in the locker room at Doak Campbell against Florida my senior year. we are NOT getting to the quarterback. We NEED to get to the quarterback. Get HIM on the ground!' And it was me, Dockett, Kevin Emanuel, Eric Moore, Womble, and Travis Johnson. And we looked at each other and we said, 'Hey, we're fighting for respect here, this is our stadium.' And we went out there and got the job done." G & G: Do pro coaches believe guys from FSU are better prepared than players from other schools? AJ: "Oh, yeah. Because we prepare like pros at Florida State. They get you ready for the next level. So when you go there, you know how to study film. You know that you need to be on time. You know that you need to be prepared when you come to the meetings. You know you need to act like a professional, on and off the field." G & G: You sound like you might have coaching in your future after your playing days. AJ: "I really do, and it's a tribute to all the coaches I've had there at Florida State — Jim Gladden and Jody Allen, Coach Andrews and Coach Amato. They really shaped my life. If it wasn't for those guys, and my high school coaches, I wouldn't be where I am today. So when I'm done with my career I want to be a coach. I want to help a guy go from nothing to being somebody — including being somebody's husband." G & G: Any message for the FSU fans who enjoyed watching you play? AJ: "Only message I have is, Go Noles, baby! We may have been down for a couple of years. But we're gonna believe in Coach Bowden and he's gonna get us there."